By combining archaeological, paleontological, and genetic evidence, an international team of researchers has identified a previously unknown hybrid species that contains both bison and cattle DNA. The discovery solves a longstanding mystery about the origins of modern European bison. A new paper published in Nature Communications serves as an excellent case study in how several different disciplines can be brought together to solve a complex scientific problem—and how the work of ancient humans can be brought in to help. Owing to a dearth of fossils, paleontologists have struggled to understand the origins of the modern European bison, one of just a few large land mammals to survive the late Pleistocene extinctions at the end of the last Ice Age some 11,000 years ago. By analyzing the ancient genomes of 64 bison, and cross-referencing these findings with ancient European cave art and radiocarbon-dated bones, researchers have shown that a new species of bison appeared around 120,000 years ago. This event was an unexpected product of the interbreeding between the now-extinct Steppe bison and the aurochs, an ancestor of modern cattle. This hybrid creature would eventually emerge into the animal we recognize as the European bison, but there’s a tremendous 108,000-year gap in the fossil record. European bison only appeared in the fossil record around 11,700 years ago, which coincided with the disappearance of the Steppe bison. Due to a lack of older fossils, paleontologists were at a loss to explain where this new creature suddenly came from. To solve this enduring mystery, Alan Cooper from the University of Adelaide in Australia recruited the assistance of several other institutions, including the University of California, Santa Cruz (UCSC), Polish bison conservation researchers, and paleontologists across Europe and Russia. And unbeknownst to the ancient humans who drew paintings on the walls of caves over 20,000 years ago, they’d be recruited as well; their renditions of these ancient species would be used to fill the holes left in the fossil record. The geneticists on the team extracted the bison’s evolutionary history from its ancient DNA, revealing a hybridization event in its distant past that involved the Steppe bison and the aurochs. Radiocarbon dating was applied to bones and teeth found in caves across Europe, allowing the scientists to establish timelines and trace the genetic history of bison populations through time. Incredibly, early cave artists recorded distinct creatures consistent with these findings. Despite the fossil gap, the evolution of these animals as depicted in cave art between 21,000 and 18,000 years ago was accurately matched to the genetic evidence. 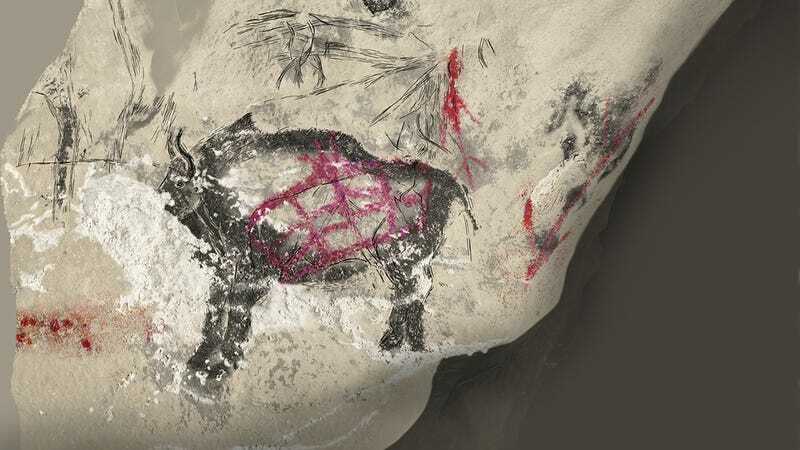 To prove this, Cooper’s team sought the expertise of French cave researchers, who verified the presence of two distinct forms of bison art in the Ice Age caves. What’s more, the ages of the paintings matched those of the different species. They didn’t know it at the time, but the cave artists were documenting two species in transition. Looking at the paintings, the researchers noticed changes in the appearance of bovids that coincided with the emergence of European bison. Paintings that were older than 18,000 years ago depict animals with long horns and large front legs (similar to the American bison, which are likely descended from Steppe bison). But more recent paintings from around 12,000 to 17,000 years ago show animals with shorter horns and smaller humps—animals that are similar to Modern European Bison. The researchers say the cave paintings are reliable in terms of their accuracy, recording more detail than what’s typically appreciated. “In this case, supposed stylistic or cultural variation in bison depiction turned out to be accurate recording that there were two different forms of bison at the time: the new hybrid species we’ve detected, and the standard Steppe bison,” Cooper told Gizmodo. The discovery of a hybrid species came as a surprise to the researchers, who say this doesn’t typically happen to mammals. When it does happen, such as the intermixing between polar bears and brown bears, the “daughter” species is almost always subsumed back into the population of the parent species—the brown bears in this case. The reason is that the hybrid isn’t really adapted to any particular environment, consisting of half of one animal, and half of another. This animal has had a history of touch-and-go survival, one that extends right through to the 20th century. Following the First World War, the population was reduced to just 12. This tremendous bottleneck resulted in significant alterations to the bison’s appearance, which explains why the ancient form appears so much like a new species. Today, the European bison survives in protected reserves in forests between Poland and Belarus.